Somebody emailed me this webcast where Justin Reid from VisitBritain shares their social media strategy, examples, results and learning. Very insightful. Here are my key take-aways. VisitBritain’s rightly concluded that in order to target people in the decision making process, they need to engage in other places like third party websites. A content partnership with Yahoo is working very well for them for example. I wondered about the same thing about a year ago in this blog post. As people become overwhelmed with email, they pay less attention to marketing messages, even when they opt-in. This kind of change won’t happen overnight but social media is an environment where people are easier to engage, two-way dialogue is possible and content is easy to share. Through re-tweets on Twitter, and by tagging and sharing on Facebook, a message can travel far and wide in a very short period of time. And the content itself is much more credible because it’s endorsed by a friend who shared it. Tourism Australia’s fanpage with over 600,000 fans is a good example. Every message they posts could be read by that many people. And for every person that comments on the post, the post gets published to their friend network, extending reach with the potential to organically grow their fanbase. VisitBritain is agnostic about where content is being consumed and as a result, more of VisitBritains content is being consumed on third party websites. A partnership with Yahoo produces an exponential amount of views, for free. More videos are viewed than some market websites receive visitors. Producing or gathering the right content, and pushing it out into place where you add value for the publisher and the consumer, preferably with easy sharing opportunities is much more effective than trying to generate website visitation through advertising alone. VisitBritain set-up a Flickr group called Love UK and is using it as one of the sources for its photos on VisitBritain.com. And because most people are happy to see their photography used, they will tell everybody about it.. on social media. Brilliant. This is something I’ve advocated for years but I could never get it going. 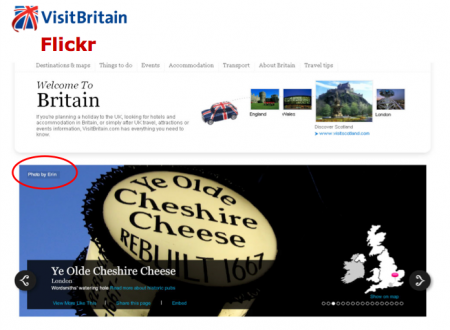 Well done VisitBritain. 07.19.10 | Permalink | Comment? 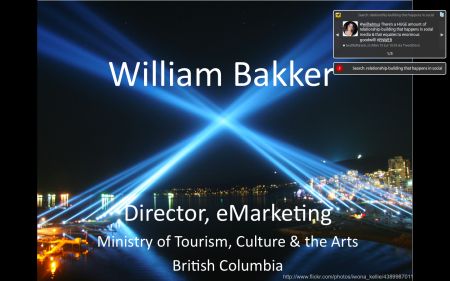 Today I presented our social media strategy for the 2010 Olympic and Paralympic Games at the PNWER conference in Calgary. One of the things that goes through my mind while I’m presenting these days is “what are people in the audience tweeting about this presentation RIGHT NOW?” Today was different. I could see exactly what was going on. At the start of my presentation I asked @seattlemaven (who runs Seattle’s Twitter account and was invited to speak but couldn’t be there in person) and the Twitterverse in general a few questions about social media via Twitter. I set-up Tweetdeck notifications and throughout the presentation, answers and comments popped-up on the screen. The result was organized chaos, but I think it told an interesting story about the power and immediacy of social media. Either way, I had a lot of fun and great feedback from the audience. Here are the questions I asked and the answers that came by during my presentation. @seattlemaven When did you start, how many interactions do you have a day on average, and how much time does it take you? @seattlemaven How are you different from a phone or in-person interaction with a consumer? seattlemaven:@wilhelmus Pnk Ultralounge opens in a month – we can’t wait! Swanky & hot!! seattlemaven:@wilhelmus Amber in Belltown’s hip & fun – great drink specials & a private room that’d knock their socks off! 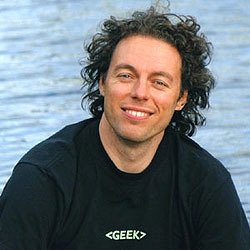 mikalat: @wilhelmus Also – LURK! Read, follow and find out what your competitors are doing and take notes. Learn first, dive in second. erikrolfsen: @wilhelmus Don’t be a stranger. Fill out that profile information and do it in a way that will interest people. nigel220: @wilhelmus we could learn a lot by listening to our youngest employees when it comes to social media!! 03.01.10 | Permalink | Comment? An event like the Olympics makes all media, including social media, light up like a Christmas Tree. Everybody’s talking about it, and that’s exactly what we want. Instead of adding to the noise, our strategy for social media during the games focussed on supporting and encouraging key influencers while leveraging our own network. Social media is the largest focus group out there so we treat it as a huge research opportunity. Data has been collected and will be analyzed. We’ve also used our monitoring tools to provide insights to our media, SEM Field Reporters and content teams. This enabled us to quickly respond to unexpected stories. After the games, we can look at the data to identify what resonated about Vancouver and BC as a destination, potential new markets or product opportunities and key influencers in social media for future engagement. Working with key influencers is a lot like working with travel media professionals (with a twist) especially since many traditional travel media have their own blogs. But there are also pure social media influencers, including local bloggers, athlete tweeters, etc. Jose from our online team has been working closely with our Travel Media team to coordinate efforts. We used the pre-Olympics to experiment with running contests on Twitter. We managed to more than triple our number of followers by giving away some Olympic tickets. We were wondering if people would leave right after, but they didn’t and instead are engaging with Karen, our tweeter extraordinaire, and re-tweeting our messages to their networks. As an added bonus, our contest winners have been tweeting and blogging about their experiences and traveled around with our Field Reporters. Facebook fans and Twitter followers are a diverse group of BC residents, past visitors, tourism industry stakeholders and people who would like to visit. During the games, we tweeted information about the games, general trip ideas based on what was being talked about and re-tweeted messages from others. URLS’s were being tracked and during the games period, drove almost 50,000 visitors to our website. Karen set up searches in Tweetdeck to filter people who expressed an interest in visiting and started the conversation to make the trip a reality leading to wonderful conversations, new followers and hopefully visitors soon. 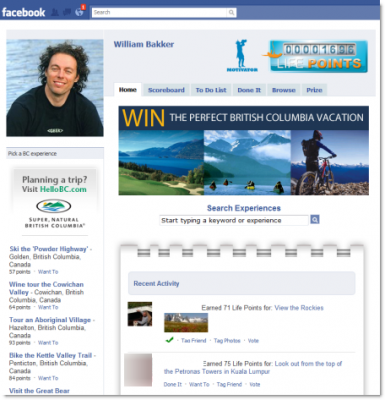 Lifepoints is a Facebook application where you get points for your life experiences. Points are based on how people have rated each experience. Compete with your friends for who gets the most out of life and create your own bucketlist by ‘wanting’ things. A natural fit with tourism so we’re running a campaign with Lifepoints to highlight some of the great experiences British Columbia has to offer and promote our contest. And of course we wanted to capture the excitement of the games through our Field Reporters. They’ve been all over town, and the rest of the province, to capture the Olympic vibe, the reactions from spectators, athletes and celebrities, against the backdrop of the destination. The future of DMO websites needs real time and social content. Yesterday, our Torch Relay Field Reporter program is a good example of a step towards real time content. And I use social in a broad sense. It means collaboration with people who have a personal or commercial interest in assisting potential travelers to visit a destination. In our case, our province is a collection of regions, cities and communities; most with their own DMO. Last year our regions took a bold step and decided to use their region on HelloBC as their website. Instead of both spending time and money on development, content, SEO, SEM, etc, we’re now collaborating and HelloBC is better for it. Most DMO’s are also using Twitter now. Twitter is a great way to connect our website visitors with local experts and give them real time information about regions and communities. 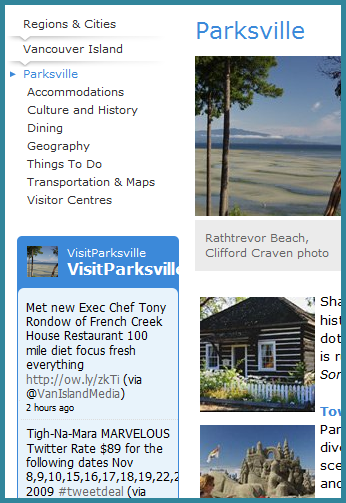 So we’re starting to add the local DMO twitter feeds to the relevant pages of HelloBC. Another step towards a more social and real time website. 03.14.09 | Permalink | Comment? Awesome. Couldn’t have said it better in less than 140 characters myself. 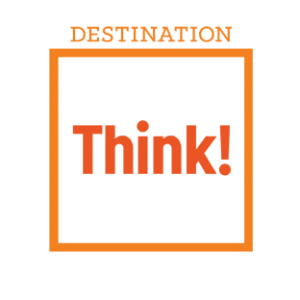 I’ve been trying to wrap my head around what the opportunity is exactly for a Destination Marketing Organization like Tourism BC. Here’s where I’m at. I welcome your input. Twitter is social, so it’s up to an individual to choose to follow somebody. To a bit of understanding about what would motivate somebody to follow a DMO, I posted a short survey on Twitter. I didn’t get near enough responses to give it statistically valid results (n<100) but its something (feel free to fill it out and re-tweet). My hypothesis that there’s a difference between what people expect from a local or a far away tourism board seems to be true. Locals are interested in current information while long haul visitors look for ideas, deals and help in trip planning. Makes sense, people’s needs depend on the level of knowledge about a destination. how about a “virtual” Visitor Information Centre/counsellor where visitors could ask questions about what to do, etc. Comcast’s Frank Eliason is universally hailed for his ComcastCares account where Comcast customers can ask questions or get help with service problems. Many DMO’s already sun visitor centres and/or call centres. Twitter is another channel for communication. I wonder how this would scale though as Twitter grows. Creating a network of Twitterers in a destination, each as an expert for a particular area or sector is one option. It doesn’t have to be a DMO representative answering the question, there are plenty of local experts out there. Building the network and distributing questions is the role of the DMO. Sends you on a “5 second holiday” each day with breathtaking photos. This falls more into the broadcasting category and that means you need to be careful because it’s easy for people to perceive your message as spam and unfollow you as a result. But as the survey above show, there’s appetite for this information. So how to go about it? Twitter is about information sharing. But quality, quantity, frequency and communication style are important. I’ve been active on Twitter for almost two year and here are my observations. Add links. Pointing to quality information is key to Twitter. Don’t just link to your own website. Be diverse. By using a URL shorterner with reporting features like budURL or Cl.igs, you can measure the quality of your tweets by the number of clicks it receives. Frequency. Don’t post one tweet after another but space your informational tweets. You can use a tool like Tweetlater to schedule tweets. I use it for my ‘Good Morning’ tweets to cool BC photos. People are creatures of habit and people will look remember similar pieces of information at a regular time of the day. Communication style. Just like all social media, the communication style needs to be conversational and authentic. No marketing talk; this message is from a person on behalf of a company. Companies can’t talk. The quality of information needs to be good. This is very subjective of course, and learning through trail and error is probably your best bet. Measuring re-tweets (what’s retweet) is another good way of measuring the quality of your information. Ask me questions and engage me. @wilhelmus we have a winery named after you in the Finger Lakes! 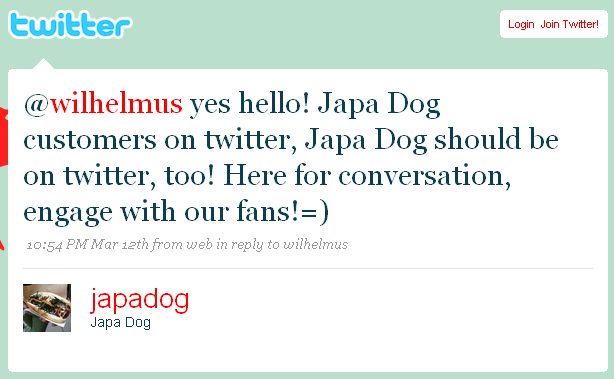 http://w ww.wilhelmusestate…. Twitter is about personal communication. Broadcasting general information is hit an miss for people. But if you make a personal connection, either through a gimmick (like my name) or an interest, the communication becomes a lot more meaningful. Again, scaling is tough. We receive millions of visitors to our website. There’s no way we can develop a personal relationship with every person on Twitter. But our network of tourism partners certainly can. The operator ultimately delivers the experience after all. Take suggestions – ask us what the best cafe is in Revelstoke or great family camping etc. Twitter is a community. People build their their network by following and being followed by other people. As a DMO, you need to work just as hard at your network as other people. When you create a thriving network, the network is the marketer, not the DMO. As a DMO, you can activate this by engaging the network as suggested above. Your network needs to include a diversity of ‘local experts’ that you can use to assist and connect with people. This is where Twitter excels. It’s how David Armano raised thousands of dollars for a friend in need. It’s how Twitter is rapidly becoming a channel for live witness news. Twitter can be a valuable tool for DMO’s by providing information and support for travelers and potential travelers. It’s important to understand Twitter is a social channel and not a broadcast channel. The personal and one-on-one communication style of Twitter is hard to scale. That’s why it’s important to build a network of people from your industry and past travelers and passionate residents you can activate. Build your network and start engaging people. Use re-tweets to find the right person to assist and inform potential travelers. You can also use search and alerts to find people with questions that relate to your destination or related tourism experiences.